Syeda Afifa Azam, the wife of late Ghulam Azam, has filed a general diary entry at Ramna Model police station seeking the whereabouts of her son Abdullahil Amaan Azmi, who was recently abducted by men claiming to be members of Detective Branch of police. The general diary entry was filed at around 10 pm on Wednesday towards Ramna Model police station Officer in Charge (OC). At the time, Mrs. Afifa Azam was accompanied by two lawyers, Advocate Nuruzzaman and Advocate Yusuf Molla, and her grand daughter Bilqis. On the night of the 22nd of August, ex-Brigadier General Abdullahil Amaan Azmi, the son of Ghulam Azam, was abducted by men in plainclothes claiming to be members of Detective Branch of police. No trace of his whereabouts has been found till now. On being questioned by media over the issue of the general diary entry at the police station, Advocate Yusuf Molla said, Ramna Model police station Officer in Charge Moshiur Rahman had accepted the general diary entry. Moreover, he had assigned Inspector (Investigation) Ali Hossain to the task of investigating the matter. I, the undersigned, an old aged ailing woman, Sayeda Afifa Azam (84), husband late Professor Ghulam Azam, Address 119/2, Kazi Office Lane, Boro Moghbazaar, Subdistrict-Ramna, DMP, District- Dhaka, would like to inform you with due respect that my fourth son Abdullahil Amaan Azmi, aged 57, height 5’6”, skin colour fair, Bangladesh Army ex-Brigadier General, was forcefully taken away along with our house guard and the house maid to an unknown location on 22/08/2016 at around 9 pm by 20-30 miscreants who arrived at the 7th floor of the building at the above address, entered using force and also confiscated 7 mobile phones, one tab and a CPU during the ordeal. I came to know from a guard on the ground floor and our neighbours that there was another group of 25-30 more people stationed outside the house who had come to the location at the same time. They arrived in around twenty vehicles, and my son was taken away in one vehicle with the number plate Dhaka Metro-Gha-14-1680. In the group of 50-60 people, most identified themselves as members of the Detective Branch of police. Later, when we contacted the police station and the office Detective Branch, we were informed that they did not have my son in their custody. On the next day, news regarding the arrest/disappearance of my son was also published in several national newspapers. I am an old woman. Since the rest of my children stay overseas, I have nobody to look after my wellbeing and needs except this one child of mine. The disappearance of my son Abdullahil Amaan Azmi has left me in shock; thus I was unable to inform you of the matter of his disappearance immediately. At this junction, I sincerely hope and pray that you would initiate the appropriate measures to record the incident of the disappearance of Abdullahil Amaan Azmi as a general diary entry and take appropriate legal measures and provide services to locate his whereabouts immediately. The first thing I decided to do after joining Jamaat-e-Islami is resign from my responsibilities in both Tablighi Jamaat and Tamaddun Majlish. It was a struggle leading the Rangpur branch of two organisations at the same time, but I had felt it necessary as I was compelled to be involved in both the organisations to fulfil my Islamic responsibilities. When I found the combination of both in Jamaat-e-Islami, I thought it was proper to leave both the organisations and concentrate on the new path I had chosen to pursue. Even an expert in the Arabic language will struggle to understand the Qur’an properly as a book. To understand the Qur’an one has to first understand what responsibilities, as a Prophet, were entrusted upon the person to whom it was revealed. The Prophet’s (PBUH) main responsibility was to guide humanity towards peace in this world and salvation in the hereafter by establishing the only pure, perfect and balanced way of life in every sphere of society. The Prophet’s life in his last 23 years was the practical example of this responsibility. Angel Jibrael (May Allah be pleased with him) would come at different stages of the Prophet’s life and reveal verses from the Qur’an, which were later compiled as the whole Qur’an consisting of 30 parts. Therefore, whatever the Prophet said and did are the practical explanations of the Qur’an. It is not at all possible for one to understand the verses of the Qur’an by just mastering the Arabic language, separating them from the history of the Islamic movement that the Prophet led, from receiving the first revelation in the mountain of Hera until his death at the age of 63. The Qur’an is the guide book for the Islamic movement and it is completely impossible to understand it by separating it from the movement. Only those who follow the footsteps of the Prophet in striving to establish Allah’s Deen can internalise the essence of the Qur’anic message, because they can relate their own issues to the ones the Prophet faced, and to the solutions Allah provided for them in the Qur’an. They will feel that the Qur’an was revealed for them. I had the opportunity to listen to his explanations of the Qur’an for three consecutive weeks, which completely blew me away, particularly the process of trying to understand the Qur’an. I was wondering where he learned his amazing system. When asked, his simple answer was that it was not to his credit as he got everything from Tafhimul Qur’an by Mawlana Mawdudi. When I heard that it was available only in Urdu, I decided to learn the language to have access to the treasures hidden in it. I had learned Urdu while working with Tablighi Jamaat, but I knew that would not be enough to understand Tafhimul Qur’an. I made an agreement with Professor Mahfuzur Rahman of the Urdu department that he would teach me Urdu and I would help him learn Bangla. Mr Khaleque had told me to first read and internalise the introduction. The language seemed quite difficult initially and I had to ask for the meaning of a number of words from my Urdu mentor. By that time I got completely absorbed into learning the language, and my Arabic background helped me a great deal as many Urdu words have been borrowed from Arabic. It took me a while to grasp the introduction of Tafhimul Qur’an, but once it was done, I developed the technique of how to approach studying the Qur’an. Later, I wrote a book called Qur’an Bujha Shohoj (Easy understanding of the Qur’an) on the basis of the introduction in order to provide tips for the common people to understand the Holy book. I feel that the sin I had committed by stopping the study of the Qur’an can be slightly compensated through this small effort. After a few months’ effort I started feeling that I had achieved some command over the Urdu language. It is not possible to describe the pleasure of learning a language. I felt even more encouraged when I heard that almost all the important books in Arabic on Islam had been translated into Urdu, so a well-rounded knowledge about Islam was possible to achieve. I found learning Arabic much more difficult than Urdu and realised that I would need much more effort to learn Arabic than I had to give for Urdu. I regret that I could not achieve a full command over the Arabic language. I wasn’t able to give more time for this, being too busy with the work of the Islamic movement. There was an opportunity to learn Arabic during my exile life from 1972 to 1978, but I was engulfed in too many problems and I was not able to concentrate on this task. I am having to leave this world with this feeling of guilt. I continued to study the Tafhimul Qur’an with deep satisfaction and within six months I developed tremendous love for Mawlana Mawdudi. He was then serving life imprisonment having been relieved from the death sentence. I sometimes became so emotional while reading that I would interrupt my reading only to pray for him. The dua for him was spontaneous particularly when I was able to understand the proper meanings of some verses that I had not been able to grasp before. When I returned to Rangpur after the winter holidays in 1955, I found some Urdu books sent to my address from Delhi and Karachi. I started reading them with curiosity and found that all the books contained fatwas against Mawlana Mawdudi and Jamaat-e-Islami. I realised that these books had been sent to me by the efforts of my respected Tablighi leader the President of Tablighi Jamaat in the then East Pakistan Mawlana Abdul Aziz; otherwise no one in those places would know my name and address in Rangpur. I felt that he loved me so much that he was desperate to ‘save’ me from the ‘wrong’ path. He sincerely believed that Jamaat-e-Islami was worse than the Qadianis (the Ahmadiya community). Some writers did not show personal hatred towards Mawlana Mawdudi, but criticised some of his works through logic and from a neutral point of view. This taught me that it would be wrong to consider Mawlana Mawdudi as infallible and follow him blindly. No person other than the Prophets is infallible, so everyone has to be judged on the basis of what the Prophet said. While quoting Mawlana Mawdudi, they deleted things he said before or after the quoted elements so that it would look extremely offensive to anyone reading it. Sometimes they added words or phrases to Mawlana Mawdudi’s writings and attributed it all to him. Sometimes they quoted a sentence from Mawlana Mawdudi’s books that Mawlana actually quoted and criticised himself in his books; but here they attributed those controversial elements to him. I found one writer who did not show hatred but disagreed with everything Mawlana Mawdudi said about prayer, fasting, alms giving and pilgrimage; which made me convinced that he considered Islam only a religion and not a revolutionary movement. These books made me read many books by Mawlana Mawdudi in a short period of time that I wouldn’t have otherwise. This enhanced my knowledge on the Islamic movement, Islamic organisation and different aspects of Islam in general. These books helped me to be careful not to consider every view of Mawlana Mawdudi as infallible just because of my deep respect for him. It helped me to resolve that I would not consider any book as a document unless it is backed up by the Qur’an and Hadith. It enabled me to understand the difference between the language of sincere and constructive criticism and the language of hatred so that I accepted the former and rejected the latter. 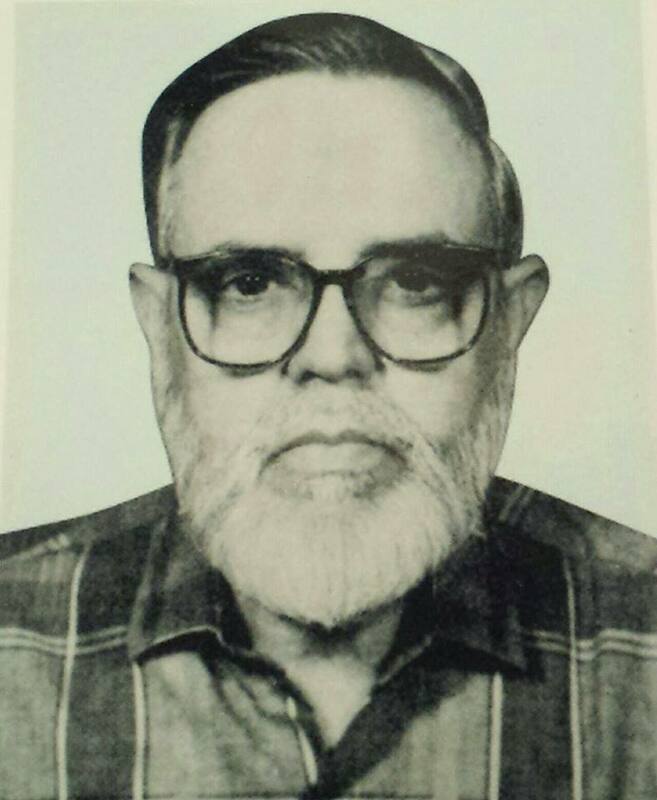 It is with great sadness that we share the news that Prof Ghulam Azam’s younger brother, Prof Ghulam Muazzam, passed away today 22nd Jan at 3.45pm in Dhaka at the age of 90 – Innalillahi wa Inna Ilaihi Rajiun. Prof Muazzam was one of the leading medical scientists of Bangladesh and a top pathologist. A gold medalist from Koltkata Medical College, he taught at Dhaka Medical College, Rajshahi Medical College and served as Principal of Sylhet Medical College and later Rangpur Medical College. He was the founder of Ibn Sina Laboratory where he also fulfilled the responsibility of founding chairman. He served as a fellow in medicine in London at the Nuffield Foundation UK, as a Professor at Al-Fatah University in Libya and as Professor of Pathology at the University of Ghana. While holding important positions both home and abroad he never compromised his principles as a true servant of Allah. Among his works, he published research into the medical benefits of the Islamic fast in Ramadan and on the Qur’an and science. 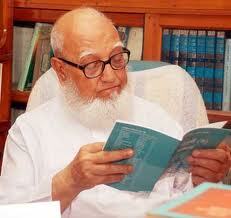 He was extremely close to Prof Ghulam Azam and had always supported him in his efforts for establishing Islam. He was also extremely loving to Prof Azam’s children and grandchildren. He had spent the last 10 years in illness, suffering from Alzheimer’s disease. We request all to keep him and his family in your prayers. May Allah forgive all his sins and grant him the highest place in Jannah. May Allah grant the family patience to bear this loss. Prof Ghulam Muazzam is survived by his children, grandchildren and great-grandchildren. His janaza prayer will be held after Jumuah on 23/1/15 at Moghbazar Qazi Office Lane mosque, following which he will be buried at the family graveyard next to the mosque, joining his parents and his brothers already laid to rest there. 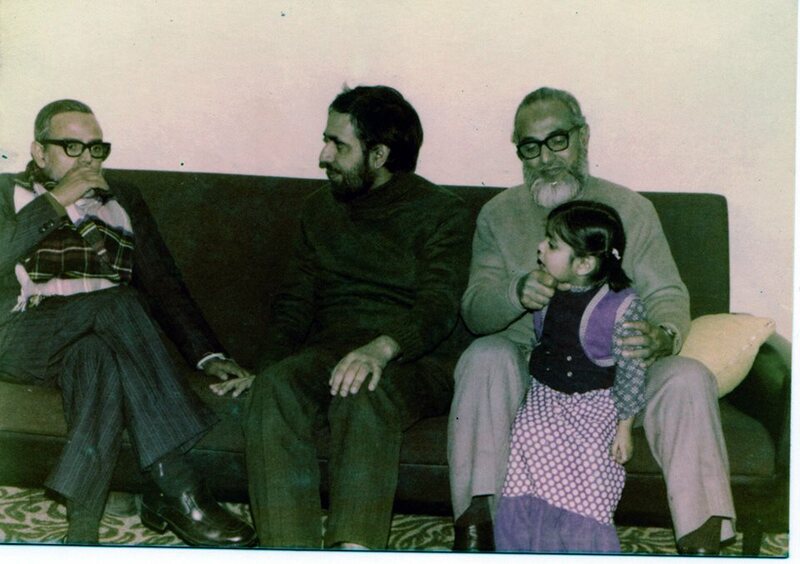 Prof Ghulam Muazzam can be seen in the following picture seated on the far left. His brothers the late Prof Mahdi Uzzaman is seated centre and the late Prof Ghulam Azam is seated far right.